Rapid technological progress, threats to environmental sustainability, and demographic transitions, are bringing about unprecedented disruptions in industries, economies, and societies globally. How can we adapt our training and educational systems for the changing world of work, that finds itself at the centre of these disruptions? UNESCO-UNEVOC International Centre organized a two day TVET Learning Forum hosting more than 100 global TVET stakeholders to understand the impact of different ongoing disruptions on skills, and discuss how their TVET systems are responding to the challenges and opportunities in the era of digital disruption, sustainable development, and displacement of people. 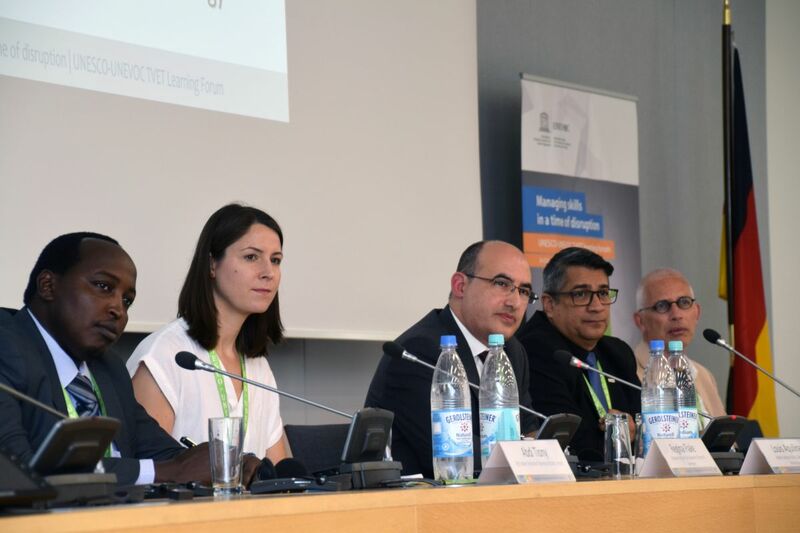 The opening session Forum, hosted at UN Campus in Bonn, included Ms.Elke Büdenbender – Spouse of the President of the Federal Republic of Germany, who has been an ardent proponent of TVET in Germany. As the Patron of the German Children’s and Youth Foundation, she has advocated for strengthening vocational training and encouraging prejudice-free occupational choices for the youth. Speaking at the occasion, Ms. Büdenbender stressed upon the importance of TVET in countering the challenges of youth unemployment. She also highlighted the role TVET can play in enabling productive learning & professional opportunities for migrants, and promote their social integration. Senior representatives of key UNESCO-UNEVOC partners also joined Mr. Shyamal Majumdar, Head of UNESCO-UNEVOC , and Mr. Svein Osttveit, Director of Executive Office and the Director of the Division of Policy and Learning Systems in UNESCO's Education Sector, to establish the policy context for discussions during the Forum: Ms. Susanne Burger from the German Federal Ministry of Education and Research (BMBF), Ms. Marion Edel from the German Federal Ministry for Economic Cooperation and Development (BMZ), Mr. Reinhard Limbach - Deputy Mayor of the Federal City of Bonn. Aimed at improving the global understanding of and reinforcing ideas for skills development through TVET to counter the effect of disruptions in the world of work, experts and TVET stakeholders from over 30 countries across five regions share their insights throughout the Forum. With TVET systems distinctly responding to the requirements of the labour market, there are high expectations of TVET systems around the world to evolve and reinvent themselves to alleviate their impact on employment and promote lifelong learning. 'The first plenary session A world in flux – what we know of the impact of disruptions set the context for subsequent discussions of the Forum by shedding light on major disruptions caused by environmental, digital and demographic transitions and their impact on TVET and the world of work. Chaired by Mr. David Atchorena, Director, UNESCO Institute for Lifelong Learning, the panel included experts from UNESCO, OECD, ILO and the ETF, who shared insights on the digital, green and non-cognitive skill needs, the nature of the requirements for facilitation of youth towards labour mobility and employment. The panelists represent the Inter-Agency Group for TVET (IAG-TVET), which is a coordination mechanism to exchange knowledge and collaborate in developing policy areas in TVET. The second plenary ‘Managing the effect of disruptions through improved governance of TVET systems’ discussed country-level responses and initiatives in governance of their TVET systems to grapple with the effects of these disruptions. Chaired by Mr. Pradeep Monga, Deputy Executive Coordinator of UNCCD, the session included presentation of country case studies of Canada, Ivory Coast, and Germany, by representatives of Colleges and Institutes Canada (CiCAN), Fédération Ivoirienne des Petites et Moyennes Entreprises (FIPME) et du Conseil National des Branches Professionnelles (CNBP), and BMBF. The third plenary ‘Enhancing pathways for learning’ , examined different policy and institutional approaches and routes that can support and enhance learning pathways for young people, disadvantaged and vulnerable groups including women, and displaced individuals. Chaired by Mr. Loukas Zahilas, Senior Expert at CEDEFOP, panelists from BiBB- Germany, Tknika – Basque Country Spain, UNESCO and Skills Policy Ltd., TESDA – Philippines, and the Prime Minister’s Office Iraq. Strategy Labs were also organized to serve as interactive platforms for discussion on practical and effective strategies to manage skill responses to the disruptions addressed by the Forum. The sessions were organized and facilitated by Members of the UNEVOC Network, UNESCO and its partners involved in recent research, capacity building and other collaboration activities. They discussed key issues and opportunities addressed by the Forum, and examined disruptions – their implications for TVET and skills development – and available tools and resources to turn these disruptions into a positive force. TVET is a valuable ground to engage different actors, resources, and to develop new investment schemes that can address disruptions. Convincing other actors to get involved requires an understanding of the return on investment in TVET. On the one hand, the economic impact is often easy to demonstrate using employer data. Social benefits on the other hand, including the impact to society and the individual, are often not quantifiable using these data and not systematically integrated when analyzing the returns of TVET. More should be done to collect hard evidence on both, as both sets of data are required to guide employers and public authorities, help individuals make career choices, and encourage a multi-level participation. TVET authorities should develop and share more examples. There should be more efforts to analyze or measure the return on investment where cases are scarce. These authorities need to build capacities in data collection, establish norms for data sharing across different stakeholders, and support the transfer of return on investment analysis frameworks across different TVET settings. This includes the informal sector, which accommodates high rates of youth that have fallen out of formal systems. Tools to better understand the issues around the return on investment should be disseminated effectively. UNESCO-UNEVOC and NCVER have developed a framework and practical guide that will be published in 2018. These tools can help strengthen and develop methods and approaches for TVET institutions. It is essential to have an understanding of the complexity of systems at the national and individual levels. At the individual level, more needs to be done to assess the migrants’ needs and appraise their skills. At the national level, it requires a flexible TVET system that is able to adapt to the situation of refugees. A multi-level approach involving numerous stakeholders is required. Strong partnerships and forums to share experiences and provide guidance is needed. Key actors should be proactive. Instead of only reacting to the situation, key actors should do more to tackle the issues in countries that displaced youth and adults come from. This includes, amongst other things, strengthening the education and TVET systems in those countries. Enhancing local actions for sustainable development requires committed stakeholders. TVET institutions should play a leading role to promote the Sustainable Development Goals and TVET’s contribution to sustainable development. Greening should be recognized and included as a fundamental skill throughout the entire curriculum. In addition to job-specific skills, knowledge for sustainability and promoting a ‘green culture’ are fundamental to the transition towards green societies and economies. Greening TVET requires motivated and confident teachers, and the involvement of students and other local community actors. More discussions should take place on the capacity-building needs of teachers, and the support mechanisms needed to enhance student and local community involvement. Supporting TVET teachers to teach for the digital future of work requires actions at the policy and local levels. Policies should be geared towards providing sufficient capacity-building opportunities and backing. Small-scale initiatives also should be identified and supported. Preparing teachers requires the involvement and support of many stakeholders at various levels. Additionally, mechanisms for strengthening collaboration are needed. Small-scale initiatives and good practices need to be disseminated effectively. It is important for these activities to be collected and disseminated effectively so that others can learn and implement similar practices in their contexts. TVET programmes need to promote and ensure lifelong learning. This reduces the barriers to further education. To this end, initial TVET programmes should be designed to support students to make the bridge to more advanced programmes. The changing nature of the world of work needs to be reflected in the education system. This can be done by, for example, diversifying training pathways at the post-secondary education level. Ensuring transparency is key. More is required to ensure greater transparency to promote progression pathways and reduce fragmentation. 1. Understanding disruptions requires having an overview of developments at the global and local levels. Comprehending the workings and impacts of the disruptions requires a macro-level perspective, but also knowledge about the local skill ecosystems. The impacts disruptions have on TVET and skill development must be contextualized since they can vary from one place to another. 2. Cooperation is key to strengthening TVET’s response. Skills development cannot work in silos. Disruptions are interconnected, as are the solutions. For example, one policy solution for skilling migrating populations can also enable approaches to transfer competences that increase employability, develop entrepreneurial talent, and enhance sustainability contributions in their host country. Collaboration must take the shape of inter-sectoral policy interaction and exchange, engagement of different stakeholders and players in education, training, employment, business and local communities. 3. Lifelong learning must be a key component in TVET design. Education and training play an important role to make the world sustainable and inclusive, and an emphasis on lifelong learning is essential. TVET should not only prepare students to contribute to the immediate needs of societies and economies, but also ensure that individuals are able to learn all along their lives and develop their talents and potential. This requires flexible and accessible pathways, as well as the anticipation of future skills demands. TVET also needs to contribute to the development of a mix of skills, including foundational, transversal, soft, and job-specific skills. 4. Teachers and trainers need to be empowered. The role of teachers and trainers in education and training has long been acknowledged. However, responding to today’s disruptions requires new pedagogical approaches and knowledge, not to mention motivation and approaches to take advantage of technological developments in the classroom and in the workplace. Teachers and trainers need to be capacitated to continue to play their important roles. 5. Policy-making requires broad stakeholder engagement. Responding to disruptions requires the input and voices of a host of stakeholders that are able to help progress multi-level responses and inform the development of realistic policies and actions grounded on different levels. These stakeholders include, but are not limited to, ministries, national bodies, international governmental and non-governmental organizations, the private sector, teachers and trainers and youth. The Forum concluded with messages from four stakeholder groups: youth, the Private sector, skills association, and TVET Network. The messages encouraged actions responding to disruptions. A key message that resonated in this session called upon all stakeholder groups to look from within what they can contribute to minimize the negative effects of disruptions and translate them into opportunities that promise: job readiness, youth empowerment, consultative process in policy development involving all stakeholders, and multi-level participation and accountability in TVET. 1. Develop the capacity of leaders to drive innovation and change. One of the perceived bottlenecks in effecting change in TVET institutions relates to the lack of change leaders, and a lack of capacity to develop a vision and implement change. Any action to address changes external to TVET systems can be realized by TVET leaders who are equipped with the knowledge and skills to understand the issues from the global and regional perspectives, and formulate strategies from within the existing systems and local skills ecosystem. TVET leaders need to be equipped with the tools to understand the scope of the problems and develop institutional strategies to be able to create timely responses. 2. Generate and share knowledge. Networking is about bridging experiences – transferring and connecting experiences around the world. Important to bridging experiences is establishing dialogue and an understanding of other contexts and local ecosystem responses. Guides and materials produced by UNESCO-UNEVOC and other actors in thematic priority areas help institutions implement strategies to respond to the challenges brought about by disruptions. The lessons learned from the successes and failures of others can play an important role in bridging the knowledge gap and evolving innovation in TVET. 3. Strengthen collaboration. Institutions in the network will be supported to break down the barriers and increase synergy and collaboration. 4. Under its Medium-Term Strategy for the period 2018 to 2020, UNESCO-UNEVOC will aim to address the capacity needs of TVET leaders and managers, strengthen collaboration, knowledge exchange, and peer learning. Those objectives can only be fulfilled with and through the UNEVOC Network. By increasing ownership of global challenges at the institutional level, disseminate knowledge at the national level, and develop partnership at the international level, UNEVOC Centres will be instrumental in the transformation of TVET systems worldwide. The United Nations Sustainable Development Agenda 2030, also identifies TVET as one of the key action areas in pursuit of the Sustainable Development Goals for Education, and Decent Work and Economic Growth. UNESCO, as the lead UN agency for Sustainable Development Goal 4, and the Education 2030 Framework for Action, has developed a Recommendation concerning TVET, and a Strategy for TVET (2016-2021) to support the efforts of Member States to boost the relevance of their TVET systems. The world-wide UNEVOC Network, coordinated by UNESCO-UNEVOC International Centre for TVET located at UN Campus in Bonn, is the key driver for mutual learning, capacity-building and advancing international cooperation in TVET.